Super Pool Game Review - Download and Play Free Version! Solid ball physics and easy controls make Super Pool a joy to play! 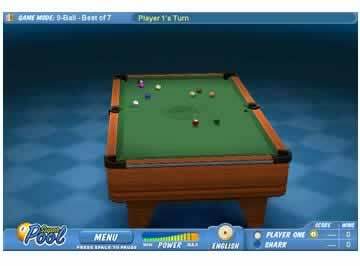 Super Pool lets you enjoy a realistic game of pool right on your PC. No need for other players, fighting for a pool table in a smokey bar or pool hall, and no need to stack up on quarters. Just click and get playing! Super Pool is an easy game to start playing. Aiming and shooting is all done with the mouse. Paths will appear on the screen and show you were the balls will go once you shoot, making it very easy to line up a shot. More experienced players can turn off this option for a greater challenge. Interested in learning or practicing some other types of pool games? Included are standard 8 ball, 9 ball, Pyramid, 3 ball, American, and Straight Pool (14+1). Super Pool is an enjoyable and realistic pool game you won't want to put down. You can play various pool games ranging from 8-ball to Pyramid. You can face off against the computer or play with a friend on your computer. You have the ability to play a single match for some quick fun, or a huge series of matches that will keep you entertained for hours. If you are into pool ,this could be just the game for you. Super Pool begins with you selecting a type of pool to play. There's the traditional games like 8-ball and 9-ball, as well as some less common ones such as Pyramid and American. Each type of pool brings its own rules and twist to the game. These different types of games add a lot of variety and keep the game interesting and entertaining. You also select whether you want to practice, play against the computer, or play against a friend. You then start the game and play matches until you either quit or reach enough wins (such as 2 wins in a best of 3 competition). Your scores and wins are tracked and displayed on the screen throughout your game. There are three different modes of play in the game. The Practice mode lets you play alone in one of the pool games, practice shots, and hone your skills. The One Player mode pits you against a computer opponent on the difficulty level of your choosing in one of the games. You can play a single match against them, or see who can win the most in a Best Of contest (best of 3, 5, 7, etc.). The Two Player mode is the same, except that you'll face off against a friend on your computer rather than a computer controlled opponent. The one downside to the modes is the lack of any online option. An option to take on other players over a LAN or the Internet would have be the perfect addition to this game. Super Pool provides three different difficulty levels when playing against a computer opponent. These levels range from an easy opponent to an extremely challenging one. This lets you find a good match for you, whether you're a new player or an experienced veteran. The controls in the game are fairly simple and referenced easily through an in-game help screen. The help screen gives you the controls for the different views you can use, as well as the basic rules and goals of the pool game you are playing at the moment. The simple controls and help make this a game anyone can easily play. The graphics in Super Pool aren't amazing, but they are on par with other similar pool games. There isn't a lot too look at, but it doesn't detract from the gameplay. Additionally, the sound is a bit lacking. The only real audio in the game is the sound of balls bouncing off each other. It leaves the game feeling somewhat quiet or empty. Some simple music could have really improved the atmosphere of the game. Another issue is with the aim lines in the game. These lines are supposed to make it easier to lineup shots, but appear and disappear randomly, making them difficult to use. If these lines were more consistent, it'd be a big help to less experienced or newer players. 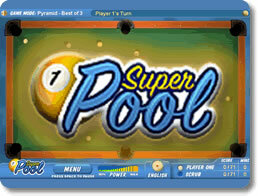 Overall, Super Pool is a great pool game that's suitable for players of all skill levels. It has a few issues and flaws like the lack of sound or aim lines not always working, but those are outweighed by the positive parts of the game. There are variety of game types to play and modes to play them in. An adjustable difficulty level gives you the ability to take on a computer opponent at your level of play. 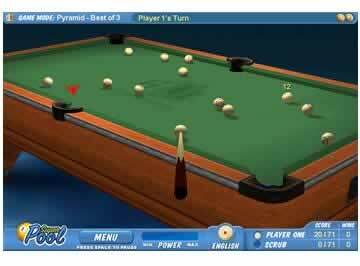 You can play the game in an overhead view, or view the table from the side behind your cue. Compete in a single match, or test your skills and endurance in a series of matches. This game is a fun and entertaining choice for any fan of pool.